As much as we try to avoid it, there are messes associated with daily life. Keeping spills contained is a priority for most everyone, but occasionally mistakes happen and you’ll end up with a stain on your fabric. 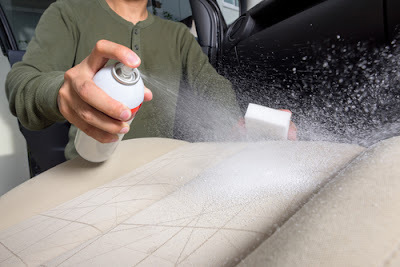 It can be tempting to immediately employ the services of professionals, but there often steps you can take to do sofa cleaning or car seat cleaning on your own. Educating yourself and then taking the initiative to clean stained fabric yourself will save a lot of money in the long run, and you can accomplish the task on your own terms and your own time. Ease the burden on your wallet and schedule by taking a look at this fabric cleaning overview and guide. To deal with enzymatic stains, you generally want to look for a stain removal formulation that contains proteases - that is, substances that break down proteins. Breaking down the proteins in a protein stain will make it easy to lift off of your favorite fabrics. For these sorts of stains, you’re going to want to look for a cleaning formula with a bleaching agent to oxidize the chemicals in the stains and fix discoloration. Bleach contains hydrogen peroxide, which targets the color-causing sections of color chemicals and breaks them down, restoring the original color of your fabric. - Grease from any sort of fried food, like pizza or french fries. - Stains from any kind of oil, like those used for cooking. As mentioned above, formulas to break down enzymes can often help, but what you generally need is a product with a surfactant. Surfactants are long chains of the carbon molecule with a water soluble “head”. What this means in practical terms, is that these molecules break down oily residue and return your fabric to like-new conditions. To get into a little more of the chemistry surrounding surfactants, the long carbon chains form structures called 'micelles' around themselves. The oily part of these molecules dissolves in the oil of the stain, and the water soluble end remains outside of the stain, pouring outwards. The water soluble end is picked up by added moisture, and the oil molecules are washed away! To put it simply, using a surfactant and adding some water will help wash greasy stains out while sofa cleaning or car cleaning. If your fabric is just generally dirty or grimy, you’re probably dealing with dirt accumulation which would make it a particulate stain. To deal with a particulate stain, a substance called a “builder” is used. Builders are chemicals that soften the water during washing, which basically means that they remove positively charged ions from liquid. Using softened water does a much better job at lifting particulate stains. This same property of builders is also helpful for tackling the stain itself. Most particulate stains are bound to your fabric by a process called calcium ion bridging. Since builders remove the calcium ions, it will break the bridge and, thus, remove the dirt. We went into great detail on the chemistry behind each type of stain, but in this section we’ll lay things out a little simpler and recommend the best type of cleaner to remove your specific type of stain. These stains call for a cleaner that will break down enzymes. Either look specifically for cleaners labeled enzymatic, or use a common cleaner like laundry detergent. The same detergent that removes these stains in your clothes should remove stains in any fabric when combined with a little water and scrubbing. Try it out when cleaning your car or sofa! Prioritize cleaners with some sort of bleaching agent. Obviously, products like plain old bleach will get the job done, but a substance that strong can remove all of the color from your fabric instead of just the stain. If you want to avoid a piece of fabric with lots of little white spots, look for a cleaner that contains some form of bleach diluted with other cleaning agents. As mentioned above, grease stains call for a surfactant to remove the oil. 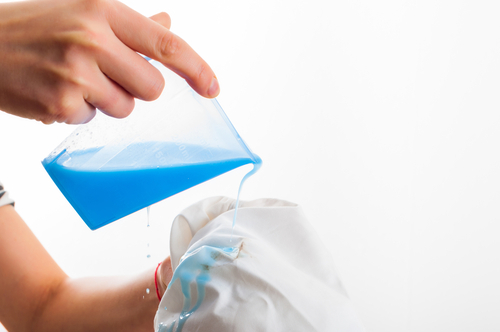 Many soaps and laundry detergents contain some sort of surfactant. You’ll notice that detergents are mentioned as an option for cleaning multiple stains on this list, and that’s because they’re generally formulated with a good combination of all of the chemicals on this list. Surprise, surprise! The best formulas for dealing with dirt stains are also detergents. Modern chemistry has eliminated the need for products that are solely made up of one cleaning agent - at least for basic residential cleaning. Use your favorite detergent, some warm water, and a solid scrubbing brush to attack dirt stains and remove them from your sofa or car seat. For all but the most serious stains, the average consumer is perfectly capable of cleaning their own fabrics. 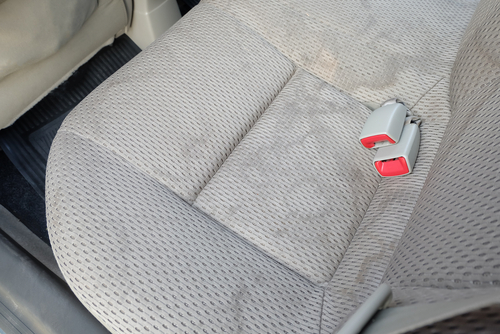 Deep seated dirt in something like a carpet that receives a ton of foot traffic may call for special equipment, but for fabrics like your cloth sofa or car seat, understanding the stain and choosing the right tool for the job should get the job nicely! We hope this article on the science behind stains and the proper way to deal with them helps you apply the new information to the stains in your life. Buy the proper materials, and get to work cleaning those pesky stains!